DAY 4, BUS 1, STRASBOURG, Welcomed by Deputy Secretary General Gabriella Battaini-Dragoni on the forecourt of the Palais de l’Europe! We had inspiring exchanges with the Council of Europe’s Deputy Secretary General Gabriella Battaini-Dragoni, Régis Brillat, Head of the Department of the European Social Charter, and other representatives from the Secretary General and Deputy Secretary General’s private office. 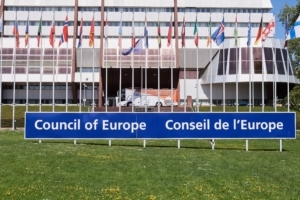 We talked about the ratification and acceptance of the different provisions of the European Social Charter, the fact that 43 out of the 47 member States of the Council of Europe are parties to either the 1961 Charter or the Revised Charter. We also discussed the link with the European Pillar of Social Rights, and the role the Council of Europe and the European Commission could play in making real progress with the realisation of adequate accessible minimum income schemes. We stressed the need for consensus about common definitions of ‘adequacy, accessibility and enabling’, where the link with the (spirit of the) Active Inclusion Recommendation is essential, and the need for a stronger framework than only ‘soft law’, namely a European Framework Directive! Now we are on the road again, heading for Austria!